모든 공간에 그들만의 감성을 선사하다. DESIGN: 디자인 예담 INSTAGRAM: @design__yedam EMAIL: yedam114@naver.com TEL: 063-227-0046 전주를 기반으로 하는 디자인 예담은 브랜드 아이덴티티에 맞춘 인테리어 디자인, 설계, 시공의 과정을 거쳐 감각적인 공간을 완성한다. 그들의 트렌드를 이끌어나가는 디자인 감각과 전문적이고 차별화된 시공 능력은 클라이언트의 니즈를 충족시키며 개성 있는 공간으로 드러난다. 디자인이란 한 사람의 생각이 그 작품에 반영되기 쉽기 때문에, 디자이너의 의견이 너무 고집스러우면 안 되며 어느 한 컨셉에 편향되어서도 안 된다. 그 시대와 환경, 더불어 사는 사람들의 의견이 반영되어야 하며, 그랬을 때 비로소 우리가 원하는 공간이 창출된다. 예담의 디자인은 너무 고집스럽지도, 가볍지도 않으며 공간의 컨셉 못지않게 주위 환경을 고려하고 있다. DESIGN: ㈜디자인이자라 WEB: www.2zala.com EMAIL: 2zala@naver.com TEL: 02-588-2361 ㈜디자인이자라는 작은 프로젝트 하나도 다른 생각, 다른 행동을 통해 다른 결과를 창출하며 클라이언트가 먼저 찾는 디자인스튜디오다. 그들은 최근의 시장에서 ‘가장 좋은 디자인이 최상의 마케팅 전략’이라는 점에 주목해, 디자인 전문가의 눈과 마음으로 프로젝트의 환경을 분석하고 새로운 컨셉을 구축하며 최상의 솔루션, 최상의 디자인을 완성한다. DESIGN: 로멘토디자인스튜디오 HOMEPAGE: romentordesign.com E-MAIL: romentor@naver.com CONTACT: 010-6322-2367 FAX: 031-377-2367 어떤 공간에 사느냐, 어떤 것을 보고 사느냐는 사람에게 적지 않은 영향을 준다. 로멘토디자인스튜디오는 이렇게 묻는다. “좋아하는 공간에서 살고 있나요? 그 공간이 당신에게 어떤 영향을 주나요?” 로멘토는 주거 공간을 주로 디자인하는 스튜디오로, 시간이 흘러도 변함없이 사랑받으며 사는 사람의 이야기를 담은 공간을 연구한다. 동시에 그들은 화려하지는 않지만 세련된 공간, 디테일한 감성을 살린 공간, 오래된 것과 새로운 것이 함께 조화된 공간을 지향한다. DESIGN: 건축공방(ArchiWorkshop) HOMEPAGE: www.archiworkshop.kr MAIL: office@archiworkshop.kr CONTACT: 02-542-3947 “일상의 건축을 생각하고, 짓고, 누리고, 공유하는 건축가들입니다.” 건축공방은 두 가지 의미를 갖는다. 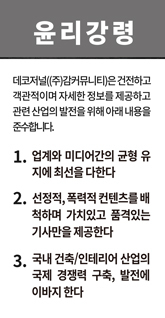 하나는 공예가의 작업실(Workshop)이라는 의미다. 다른 하나는, 서로를 공격하고 방어하는 토론(Discussion)이란 의미를 가진다. 건축은 결과적으로 보면 시각적인 작업이지만, 태생은 철학적이며 합리적인 사고를 동반하는 일이다. 이들은 스케치만큼이나 토론과 대화를 중요시한다. 건축공방이 말하는 일상의 건축은 높은 수준, 즉 건강한 환경의 건축을 의미하고, 나아가 더 많은 이들이 누릴 수 있는 확대된 건축문화를 뜻한다. 프로덕티브 주식회사(PRDTV) WEB: www.productive.kr EMAIL: prdtv@naver.com 프로덕티브 주식회사(PRDTV)는 공간에 필요한 모든 것을 만드는 공간 프로듀싱 전문 스튜디오다. 그들이 상상하고 현실화시키는 건축, 가구, 조명 등 공간을 구성하는 모든 요소들은 쓰기에도, 자랑하기에도 충분하다. PRDTV는 공간에 대한 불편한 경험이 개선을 만들고, 결핍이 열정을 불러온다고 믿으며 모든 프로젝트에 심혈을 기울인다. 그들이 작업한 공간을 둘러보면 사용자들이 실제로 겪을 불편에 대해 한발 앞서 고민하는 그들의 접근 방식에 한 번, 공간이 가지고 있는 단점을 극복하고 최고의 기능성과 심미성을 연출하는 그들의 작업 방식에 두 번 놀라게 된다. [Deco Journal Column - Ana Maria Duran Calisto] Ecological Urbanism in Latin America Part 1. [Deco Journal Column - Ana Maria Duran Calisto] Ecological Urbanismin Latin America Part 1. 1. Introduction – A New Convergence Why has Latin America so eagerly embraced the paradigm of Ecological Urbanism, one which breaks away from the dualism that has marked dominant discourses of the natural and the cultural as separate and antithetical entities within design and planning? The proliferation of conceptual and executed projects, large and small, that seek to reconcile natural and urban processes into holistic urban ecologies indicates that cities in Latin America are intellectually, politically and economically committed to resurrecting natural environments whose expression on the “skin” of the city –to use a term of Manuel de Solá-Morales- has been suffocated by fast paced urbanization since the dawn of Modernism in the region, and particularly since the 1970s. Another indication of the appreciation held by Latin America´s design and planning communities for ecological urbanism is made evident by the success of the 2014 Portuguese and Spanish translations of the book “Ecological Urbanism,” a dictionary-thick collection of multi-disciplinary essays and projects curated, edited and originally published in English by Mohsen Mostafavi and Gareth Doherty in the year 2010. The translations of the book went out of print in less than two years. This detail should not be taken for granted (Mostafavi and Doherty 2010). (Parques del Río Medellín, Colombia, 2018. The city of Medellín, famous for its decade-long plight against violence and its successful urban acupunctures, is now becoming world renown for the recreation of its river ecology.) (Photograph courtesy of Jorge Pérez-Jaramillo) Much has been written about Latin America´s “cultural dependence” on the Global North, a corollary of Dependence Theory (Cardoso & Bagú 1973, Cardoso and Faletto 1979, Cardoso & Faletto, 1996), which advances a structural explanation for Latin America´s role as hinterland (as economic and/or political colony) in a global context. The theory was developed by CEPAL (Economic Commission for Latin America and the Caribbean) in the 1960s and 1970s. CEPAL´s focus on the flow of resources –natural, human, capital, and financial- from the “peripheries” or underdeveloped nations towards the “cores” or developed nations (Furtado, 1964, Cardoso and Faletto 1969, Marini 1973) has emphasized only one direction of the flow, and the asymmetry of trade structures inherited from colonial institutions, in the complex web of exchanges that constitute the relationship between Latin America and hegemonic powers in the Global North, since the Spanish Conquest. Much has been written about dependence and at least as much should be said about resistance. Latin America does not resonate with all influences stemming from the developed areas of the world in equal measure. It is not merely a passive receptor of an active emitter. Its cultural independence is marked by the degree to which it embraces, rejects or transforms cultural frameworks imported from the developed world, but also insofar as it creates its own, contributing to international conversations from the positionality of its particularities, contexts, and experiences. In this regard, much has been said as well about the mechanisms undergirding creative processes, particularly artistic pursuits, in Latin America (Traba 1973, Traba 1974). Most art historians find a comfortable middle-ground between dependency and autonomy in Latin America, both extremes of a dialogue that presupposes a relation of total subservience or total isolation. The hybrid –the very origin of a new race that emerged from the brutal and productive forces of conquest and colonization- is often invoked as the main instrument in the creation of form, including urban form (Canclini 2005, Arango Cardinal 2013). Latin Americans are master hybridizers. They mix the impossible. How could they not love the concept of “ecological urbanism” and the possibilities it opens for hybridizing natural with cultural elements, in an interplay that evokes the ways of its pre-colonial past. (Machu Picchu, Peru. This is probably one of the most illustrative examples of an ancestral urban ecology. The Inca, like most pre-Hispanic cultures, were masters at integrating city, infrastructure and landscape.) (Photograph: Fabien Moliné on Unsplash) Another interesting theory stems from De Andrade´s vindication of cannibalism: Latin Americans’ ability to nurture themselves from different cultural sources as the impetus for their creative force. We eat as we are eaten. We love to consume otherness but also be the other that is consumed by cravers of exoticism (De Andrade 1923). We devour “ecological urbanism” and offer it a ground for enactment, in glocal terms, for it means to devour ourselves in the projection of our image as encountered in the other. The founders of the Valparaíso School of Architecture and Amereida -its annual journey across the Americas-1sought for design answers beyond regionalisms2and beyond aspiring to replicate the bygone source of pre-Columbian societies, in the very marrow of the territory through the act of traversing it. Geography, and its cultural manifestations as landscape, have been one of our key sources of inspiration in an incessant search for “identity,” an ever changing, elusive narrative of who we are. Thus we go, walking over the steps of those who preceded us in the overwhelming task of inhabiting an often inhospitable, overpowering geography, finding the traces of a deep engagement between culture and environment along the way. The journey becomes the key to the creative process in geographical approaches to art. (Structures at Corporación Cultural Amereida, Valparaíso, Chile) (Photographs by the author)  The School of Architecture of the Pontificia Universidad Católica de Valparaiso was founded in 1952 by a group of architects and artists who conceptualized the craft and pedagogy of architecture as a creative interaction between poetry, art and imaginative construction. In 1964, the school extended its poetic approach to the geographic scale and established a journey across the Americas as a means to reflect on how to build in the new world, beyond emulation and colonial matrices of thought. In 1970, the school´s faculty purchased an extensive tract of land in order to establish the now world renown Ciudad Abierta de Ritoque (Open City of Ritoque): a platform upon which experimentation could take place. Critical Regionalism is a stancewithinarchitecture which questions its universalization without promoting the mere replication of ancient or vernacular form. Ultimately, it proposes a glocal approach to architecture, one capable of achieving universal and contemporary value by drawing vitality and knowledge from the sources of local culture. It displays an embedded critique of the modern universalization and standardization of culture. The book Ecological Urbanism was embraced by Latin Americans because practitioners in the region are genuinely interested in the type of approach it offers, particularly as the region faces unprecedented environmental degradation due to extraction, incessantly growing since the 1970s. Probably and partially also because the book offers the validation and legitimation Latinos still pursue in the “core” for a design practice that has been unfolding in its peripheries since the Enlightenment. This degree of convergence between global north and global south within the design fields had not reached a new peak since Latin America embraced and transformed modernism between the 1920s and the 1960s (Bergdoll, Comas, Liernur, and Del Real 2015; Leatherbarrow 2009). Leatherbarrow insightfully notes that the continuum of Modernism in the region is a clear expression of “the almost complete negation of the ´postmodern´ approach in Latin America” which was due, he hypothesizes, to the affiliation established by the Modernist project with the region´s history and memory (2009). Nevertheless, the same could be argued in favor of Post-modernism and its historicism. I would speculate that Latin America embraced Modernism because it provided a seemingly neutral ground upon which to play out its differences, its engrained civil war between the possessors and the dispossessed. Modernism has also represented an aspiration to be Modern; to be industrial and “developed;” to reach a stage above the role the region has played since the Conquest: as provider of raw materials for the industrial world (exceptional industrial poles in Brazil, Mexico and elsewhere excluded). It could even be argued that the universal abstraction touted by Modernism found a strong affinity in the abstraction displayed by the geometric patterns, architectures and ceramic vessels of several pre-Hispanic archaeological domains (the “primitive” roots of Modern art –African and Native American- have been extensively documented). The key takeaway of Leatherbarrow´s comment, though, is that if the region were simply imitative and passive, postmodernity would have been amply embraced, but it wasn´t. Ecological Urbanism, on the contrary, has been zealously investigated. The region resonates with its interlocutors in the core when it encounters affinities and can recline the barriers of its resistance. Synergies occur when the Global North produces culture that makes sense in the Global South: ecological restoration or remediation is becoming an aspiration shared by cultures throughout the world, and a concern that runs deep into Latin America´s history, particularly its indigenous history. (Ecuadorian master Estuardo Maldonado offers an excellent example of how Modern artists in Latin America derived inspiration from the abstract forms characteristic of several pre-Hispanic material cultures. The development of modernism in the region cannot be divorced from archaeological findings. The reinterpretation of ancient geometries and materialities still underlies the work of many Latin American artists and architects. The relationship between the modern and the ancient has been highlighted by the exhibition “Southern Geometries, from Mexico to Patagonia” (Oct. 14, 2018 – Feb. 24, 2019) currently in display at the Fondation Cartier pour l´art contemporain.) (Photographs by the author) 2. Context and Background -Political Economy and Urban Form in Latin America since the 1970s To argue that Latin America has developed unique modes of urban design and intervention is to assert that the region's practices respond to particular sets of political, economic, cultural and environmental conditions that elicit alternative responses from citizens, governments, enterprises, planners and designers. Most Latin American countries resemble their counterparts in the developing world, particularly across the tropical band, in severalrespects. The explosion of self-built or “informal” structures is not unique to the region’s urban geography, nor is it the exclusive preoccupation of Latin American designers. The imperative ofresponding to the overwhelming realities of the urban poor is shared by different constituencies throughout the global south, and has even become central to inquiries in the global north, as developed nations face the "threat" of massive immigration of refugees fleeing poverty, 'natural' catastrophes, wars, famines, resource extraction, land-grabbing, and an ever-growing mechanization of agriculture.Growing awareness of the rise of a historically unprecedented urban era, in which the majority of cities expected to expand are located in developing nations and are of intermediate size (UN Habitat 2010 Report; Lee, Freudenburg, and Howarth 2012), has led scholars from diverse disciplines throughout the world to probe into the probable causes of the ´slum´ proliferation so apocalyptically described by Davis (2004, 2009). (Self-built mantels compound between 30 and 80 percent of urban tissues in Latin America) The answers are manifold and cannot be fully understood by focusing the gaze exclusively on metropolitan areas, nor by extrapolating a linear, evolutionary view of urban development from the historical experience of cities in the north to those of the south. Davis partially understood the shortcomings of this extrapolation in his essay “Planet of Slums: Urban Involution and the Informal Proletariat” (2004). What is surprising about his argument is that even though he clearly states that the rural-urban migration towards cities in developing nations should not be read as a migration analogous to the one that characterized the rise of the industrial city in XIX Century England, he fails to understand that slum dwellers in Latin America are not some kind of “proletariat” devoid of concerted political project (his expression). He does acknowledge, though, that with the noteworthy exception of China, “urbanization [in developing nations] has been decoupled from industrialization, even from development per se.” Following the lead of the United Nation´s Human Settlements Program Report The Challenge of the Slums (2003), Davis argues that the colossal accretion of informality is the legacy of the debt crisis of the late 1970s and subsequent IMF-led restructuring of Third World economies in the 1980s, through the imposition of “structural adjustment programs” or, more specifically, neoliberal policies as conditional for development credit. Cities in Latin America, with few exceptional industrial poles located in Buenos Aires, Sao Paulo, Manaus3or Mexico D.F., have not attracted rural migration because people follow jobs, and there are industries waiting to employ peasants in cities. The economies of most Latin American countries still heavily rely on the export of food, mineralsand oil. The bulk of our export-oriented political economies pivots around the extraction of raw materials (oil, natural gas, minerals, lumber), monoculture agri-business (soy, banana, coffee, sugar cane, cacao, palm oil), fish farming (shrimp, lobster, salmon, tuna) and some manufacture (clothing, shoes, car assembly, aircrafts) (CEPAL Report 2015). The economic geographies of the region’s key extractive industries are located in the hinterlands and rural areas. Because people do follow jobs, but also need to access services, what has happened is that many extended families in Latin America have strategically spread out. Some family members choose to relocate to the peripheries of cities that offer public health and education services, infrastructure, some formal and stable jobs, and opportunities in the informal economy. Others chose to remain in the hinterland -whether forest or farm- where they can access alternative formal opportunities in extraction enterprises like mining, agri-business or infrastructure construction,4in the informal extraction sector, or simply in small holding farming. Some members of these multi-sited and extended families manage to establish households in the developing world and are able to send remittances to their families back home. Rural dwellers strategically respond to structural conditions of the political economy in developing nations through a threefold strategy: household income diversification, multi-sitedness and circular migration (Hecht 2006; Padoch, Steward, and Pinedo-Vasquez 2014; Putzel and Ruiz 2014). This spreading out of the family allows it to access resources from different economies. Remittances flow to the households of informal cities in developing nations both from external economies and regional hinterlands, where the key economic resources of developing nations tend to be located. Manaus boasts the largest Free Trade Zone of South America  Particularly in lieu of the deployment of IIRSA/COSIPLAN continental infrastructures and bi-oceanic corridors since the year 2000. See www.iirsa.org 3. Urban Outcomes Davis´s Planet of Slums, like the UN-Habitat report he reviews, is not off the mark when he assigns partial causality of ´slum´ proliferation to the structural adjustment program enforced by the IMF, the World Bank and other multi-lateral agencies as a pre-condition for access to development credit. One of the key policies of this program was to reduce public spending. Governments throughout the global south decreased investment in public health, public education, and infrastructure. The areas that suffered the most from this disinvestment were rural. Urban areas became magnets because they still offered public services (health, education, infrastructure and basic services). Furthermore, this program accentuated the asymmetrical flow of resources from developing to developed nations described by dependency theory and elaborated by world systems theory (Wallerstein 2004). Harvey refers to this process of concentration of wealth across scales as accumulation through dispossession (Harvey, 2007), what Marx before him termed “primitive accumulation.” Intermediary oligarchies in developing nations, whether the elite bureaucracies of the now dwindling wave of 21 Century Socialism or the traditional holders of power and beneficiaries of privatization policies before them, remain the main benefactors in the processes of extraction and accumulation through dispossession that so vividly describe the production of marginalization in the Global South. In the developing world, urbanization does not respond to the concentration and accumulation of wealth and resources that characterizes the manufacturing poles of rising economies or the “agglomerations” of complex knowledge-based economies -mainly IT and financial cores of global scope (Storper 2015). In the developing world, a high percentage of urbanization (close to seventy percent in cities like Mexico D.F., Caracas, Lima, Medellin, and Guayaquil; UN Habitat Report 2004) responds to the strategies of survival deployed by the dispossessed and the region-wide enclosure of the hinterlands. Through the research on inequality undertaken at a global scale by UN-Habitat, we know that the Gini Coefficient –the main index to measure the wealth gap between the richest and the poorest in a society- reaches its global height in Latin America. Unequal social relationships become clearly embodied in the region’s capital, “primate” cities,5with few exceptions like Montevideo, in Uruguay. The physical manifestations of this asymmetry dot the urban landscape with archipelagoes of affluent gated communities (some sort of sprawl of walled enclaves) or the planned high-rises of residential neighborhoods amidst immense mantels of informal sprawl. As cities grow, they push the urban frontier into rural areas, creating a rural-urban mesh described as peri-urban. Affluent enclaves are modeled after the American suburb and create low-density fabrics dependent on private vehicles for transportation. Providing them with services and infrastructure is very costly and tends to absorb a large proportion of municipal budgets. In the other extreme of household income, an urban sea of tightly self-built houses has spread on land often unsuited for urbanization: steep slopes vulnerable to mud-slides; or marshes, mangroves, estuaries, and floodplain areas prone to flooding. Between the extremes of affluent gated communities and informal neighborhoods, lie middle and high-middle class districts. Historic cores are of particular interest because, as it occurred with many downtown areas in US cities, they were abandoned by affluent groups who relocated to the suburbs, and colonized by rural or foreign migrants. In the case of Latin America, a process of “favelization” of the historic districts has marked their development since the 1940s and 1950s: historic structures have been subdivided in order to accommodate much larger populations. Primate cities are not just the largest city in a nation or region, but those which are disproportionately large. Santiago de Chile provides a good example, as 40% of the population of Chile is concentrated in the capital. Bibliography Arango Cardinal, Silvia. Ciudad y arquitectura: Seis generaciones que construyeron la América Latina moderna. Bogotá: Fondo de Cultura económica, 2013. Padoch, Steward, and Pinedo-Vasquez, 2014; Putzel and Ruiz, 2014 Ábalos, Inaki, and Juan Herreros.Áreas impunidad. Distributed Art Pub Inc, 1997.de Ábalos, Inaki, and Juan Herreros. "Una nueva naturalidad (7 micromanifestos). "2G Revista internacional de arquitectura, nº22 dedicado a Ábalos y Herreros, Barcelona, Gustavo Gili(2002): 26-33. Arango, S., 2012.Ciudad y arquitectura: seis generaciones que construyeron la América Latina moderna. Fondo de Cultura Económica. Bergdoll, B., Comas, C.E., Liernur, J.F. and Del Real, P., 1980. Latin America in Construction.Architecture. Brillembourg, C. (2004).Latin American architecture, 1929-1960: contemporary reflections. Monacelli Press. Buell, Lawrence. "Nature and City: Antithesis or Symbiosis?. "Real-Yearbook of Research in English and American Literature26 (2010). Busquets Grau, Joan, and Correa, Felipe.Cities x lines: a new lens for the urbanistic project= Ciudades x formas: una nueva mirada hacia el proyecto urbanístico/Ciudades x formas. Harvard University, Graduate School of Design, 2006. Busquets, Joan. "Cities and Grids: In Search of New Paradigms. "Architectural Design83.4 (2013): 72-77. Busquets, Joan.Barcelona: la construcción urbanística de una ciudad compacta. Ediciones del Serbal, 2004. Canclini, N.G., 2005.Hybrid cultures: Strategies for entering and leaving modernity. U of Minnesota Press. Cardoso, F.H. and Faletto, E., 1996.Dependencia y desarrollo en América Latina: ensayo de interpretación sociológica. Siglo xxi. Cardoso, F.H. and Faletto, E., 1979.Dependency and development in Latin America (Dependencia y desarrollo en América Latina, engl.). Univ of California Press. Cardoso, F.H. and Bagú, S., 1973. Problemas del subdesarrollo latinoamericano.Nuestro Tiempo, México. Castro, Lorenzo, and Alejandro Echeverri. "Bogota and Medellin: architecture and politics. "Architectural Design81.3 (2011): 96-103. Cronon, William. metropolis: Chicago and the Great West. WW Norton & Company, 2009.Nature's Davis, Mike. "Planet of Slums (2006). "London & New York: Verso(2007). MikeDavis, “PlanetofSlums:UrbanInvolutionand theInformalProletariat,” New Left Review 26 (2004). De Andrade, O., 1928. Manifiesto antropófago.Revista de antropofagia,1(1), pp.3-7. De Melo Franco, F., Moreira, M., Braga, M. 2007 «Vazios de água» (São Paulo) en www.usjt.br/arq.urb/numero_01/artigo_07_180908.pdf. de Solà-Morales, Ignasi. "Terrain vague. "Terrain vague: interstices at the edge of the pale(1995): 24-30. de Solà-Morales, Manuel.Manuel de Solà-Morales: A Matter of Things. NAi Publishers, 2008. de Solá-Morales, Manuel. "La segunda historia del proyecto urbano: the second history of the urban project. "Revista anuario5 (1987): 21-27. de Sola-Morales, Manuel. "Ten lessons on Barcelona. "Association of Architects of Catalonia, Barcelona(2008). De Solà-Morales, Manuel. "The strategy of urban acupuncture. "Structure Fabric and Topography Conference, Nanjing University. 2004. de Solà-Morales, Manuel. "Territoris sense model. "Papers: Regió Metropolitana de Barcelona: Territori, estratègies, planejament26 (1997): 21-27. Solà-Morales Rubió, Manuel de. "Projectar la perifèria. "UR: urbanismo revista, núm. 9, 1992(1992). Echeverri, Alejandro, and Francesco M. Orsini. "Informalidad y urbanismo social en Medellín. "Sostenible?12 (2011): 11-24. Echeverri, Alejandro. Medellín re-escribe sus barrios. Urbanismo social 2004-2011. Revista PRUMO, PUC-Río, Río de Janeiro 1997. Echeverri, A. and Orsini, F., 2012. Informality and social urbanism in Medellin.Medellin: Environment, Urbanism and Society. Medellin: URBAM-Universidad EAFIT, pp.132-156. Frampton, Kenneth.Megaform as urban landscape. University of Michigan, A. Alfred Taubman College of Architecture+ Urban Planning, 1999. Frampton, Kenneth. "Seven points for the millennium: An untimely manifesto. "Architectural Review206.1233 (1999): 76-80. Furtado, C., 1964.Desarrollo y subdesarrollo. Eudeba. Geddes, Patrick.Cities in evolution. Williams and norgate ltd., 1949. Hall, Peter.Cities of tomorrow. Blackwell Publishers, 1988. Harvey, D., 2007. Neoliberalism as creative destruction.The annals of the American academy of political and social science,610(1), pp.21-44. Hecht, S.B., Morrison, K.D. and Padoch, C. eds., 2014.The social lives of forests: past, present, and future of woodland resurgence. University of Chicago Press. Hecht, S.B., Kandel, S., Gomes, I., Cuellar, N. and Rosa, H., 2006. Globalization, forest resurgence, and environmental politics in El Salvador.World Development,34(2), pp.308-323. Herreros, Juan. "De la periferia al centro: la ciudad en tiempos de crisis. "La ciudad, de nuevo global. 2009. Herreros, Juan, and Antoni Muntadas. "Desvelar lo público." (2004). Hise, Greg, and William Francis Deverell.Eden by design: The 1930 Olmsted-Bartholomew plan for the Los Angeles region. Univ of California Press, 2000. Guerra, Juan Herreros, and Iñaki Ábalos Vázquez. "Híbridos. "Arquitectura: Revista del Colegio Oficial de Arquitectos de Madrid (COAM)290 (1992): 54-80. Heynen, Nik, Maria Kaika, and Eric Swyngedouw. "Urban political ecology. "The nature of cities: Urban political ecology and the politics of urban metabolism(2006): 1-20. Hise, Greg, and William Deverell. "Eden by Design." (2001): 327-335. Howard, Ebenezer, and Frederic James Osborn.Garden cities to-morrow. Vol. 23. Mit Press, 1965.of IPPUC, www.ippuc.org.br Iturriaga, S. 2015 «Mapocho 42K: conectividad geográfica y social para Santiago» en Revista Ladera Sur (Santiago) 9 julio 2015 en para-santiago/>. Jacobs, J., 1961.The death and life of American cities. Jaque, Andrés.Eco-ordinary: etiquetas para la práctica cotidiana de la arquitectura= Eco-ordinary: codes for everyday architectural practices/Eco-ordinary. No. 72: 504. Oficina de Innofación Política Universidad Europea de Madrid., 2011. Jaque, Andrés. "Ecologizar no solamente es verdear. "GARCÍA-GERMÁN, Javier; MARTÍNEZ-PEÑALVER, Covadonga. Con-textos(2008): 17-23. Leatherbarrow, D. (2009). Entre el suelo y el cielo o memoria cultural e invencion en los paisajes latinoamericanos contemporáneos. InNueva arquitectura del paisaje latinoamericana= New latin american landscape architecture(pp. 4-10). Editorial Gustavo Gili. Lee, K.N., Freudenburg, W. and Howarth, R., 2012.Humans in the landscape: an introduction to environmental studies. WW Norton & Company. Lerner, Jaime.Urban acupuncture. Island Press, 2014. Martignoni, J., 2008.Latinscapes. : Landscape as raw material. McHarg, Ian L., and Lewis Mumford.Design with nature. New York: American Museum of Natural History, 1969. Mostafavi, Mohsen, and Gareth Doherty, eds.Ecological urbanism. Baden: Lars Müller Publishers, 2010. NU.CEPAL. Estudio Económico de América Latina y el Caribe 2015: desafíos para impulsar el ciclo de inversión con miras a reactivar el crecimiento. Estudio económico de América Latina y el Caribe. 2015-08. Rossetti, F., 2009.Arquitectura del paisaje en Chile: hacia un quehacer contemporáneo. Ocho Libros. Storper, M., Kemeny, T., Makarem, N. and Osman, T., 2015.The Rise and Fall of Urban Economies: Lessons from San Francisco and Los Angeles. Stanford University Press. Swyngedouw, Erik, Maria Kaika, and Nikolas C. Heynen, eds.In the nature of cities: urban political ecology and the politics of urban metabolism. Routledge, 2006. Traba, Marta. Dos décadas vulnerables en las artes plásticas latinoamericanas (1950-1970). México, 1973. Traba, M. (1994).Arte de América latina, 1900-1980(p. 89). Nueva YorkWashington: Banco Interamericano de Desarrollo. UNFPA, U. and UN-HABITAT, I.O.M., 2013. Population dynamics in the post-2015 development agenda: Report of the global thematic consultation on population dynamics.United Nations. URL http://www. worldwewant2015. org/file/313464/download/340868. Vanek, J., Chen, M.A., Carré, F., Heintz, J. and Hussmanns, R., 2014. Statistics on the informal economy: Definitions, and challenges.Working Informal Migrant Entrepreneurship and Inclusive Growth Migration Policy Series, (68).estimates regional Waldheim, Charles. "Landscape urbanism: a genealogy. "Praxis4.10 (2002). Wallerstein, I.M., 2004.World-systems analysis: An introduction. Duke University Press. Williams, Raymond.The country and the city. Vol. 423. Oxford University Press, USA, 1975. ‘도시에도 OS가 필요하다.’ 어반플레이는 자체 제작 미디어를 통해 동네를 경험하는 새로운 기준을 제시하고 있는 도시콘텐츠 전문 기업이다. 이들은 지역성을 지닌 로컬콘텐츠를 활용해 서적, 식료품, 공간, 웹페이지, 이벤트 등을 만들어내고 있다. 특히 자체 온-오프라인 서비스 ‘아는동네’를 통해 잠재 가치를 지닌 동네 콘텐츠를 육성, 실질적 경험이 가능한 결과물로 구현하고자 한다. 어반플레이의 대표 프로젝트로는 연남동 기반 식음료 문화공간 ‘연남방앗간’, 연희동 지역 콘텐츠를 소개하는 지역 축제 ‘연희걷다’ 등이 있다.